O sing unto the Lord is a relatively late work, noted in the Gostling Manuscript as ‘Written by Mr Purcell in 1688’. 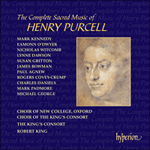 It shows Purcell at his most Italianate, with vigorous antiphony between voices and instruments, and also between a prominent solo bass and the chorus. This seems to have been a verse anthem written for a special occasion when the large string orchestra was available, with the block chords that open the work especially suited to a fuller orchestral texture. Before the imitative section that almost always makes up the second half of the Symphony in the anthems Purcell unusually adds a wonderfully expressive section (frequently marked ‘Drag’ in manuscripts), full of chromaticism and diminished harmonies. Although the writing is overtly celebratory, behind it is the deliciously wistful quality which is a feature of so much of Purcell’s music. After the strings’ Symphony a solo bass ceremoniously opens the proceedings, followed by two lilting choral Alleluias, before we are treated to the first of a series of imaginative instrumental ritornelli. The four-part verse ‘Sing unto the Lord, and praise his name’ leads straight into the mysteriously-coloured ‘Declare his honour’, which blossoms into a full chorus. Ground basses are surprisingly thinly spread in the church music (compared at least to the odes and welcome songs) but the duet for treble and alto ‘The Lord is great’ is a fine example, capped by another marvellously inventive string ritornello. The central section of the anthem is the quartet ‘O worship the Lord in the beauty of holiness’, as magical a piece of writing as Purcell ever produced. After such awestruck writing the antiphony of solo bass with choir and strings returns at ‘Tell it out among the heathen’, leading into a final section of Alleluias. 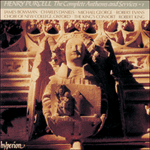 Typically, Purcell treats these Alleluias gently, and the anthem ends serenely. O sing unto the Lord (‘Oh, Chante pour le Seigneur’) est une oeuvre relativement tardive, qui porte dans le manuscrit de Gostling la remarque: ‘Ecrit par M. Purcell en 1688’. Nous y voyons le style le plus italianisé de Purcell, avec une vigoureuse antiphonie entre les voix et les instruments, et aussi entre une proéminente basse solo et le choeur. Ce morceau semble être un hymne liturgique écrit pour une occasion spéciale, quand l'orchestre à cordes entier était à sa disposition; la série d'accords de l'introduction convient particulièrement bien à une plus complète texture orchestrale. Avant la section imitative qui compose presque toujours la deuxième partie de la Symphonie dans les hymnes, Purcell ajoute ici de façon exceptionnelle une section merveilleusement expressive (qui est souvent marquée ‘Drag’ dans les manuscrits), pleine de chromatisme et d'harmonies diminuées. Bien que l'écriture soit ouvertement destinée à une célébration, il s'y cache une qualité délicieusement nostalgique qui est une caractéristique souvent rencontrée dans la musique de Purcell. Après la Symphonie des cordes, une basse solo est une introduction cérémonieuse, suivie de deux alléluias choraux rythmés avant que ne nous soit offerte la première d'une série de ritournelles instrumentales pleines d'imagination. La strophe en quatre parties `Sing unto the Lord and praise His name' (`Chante pour le Seigneur et loue Son nom') nous mène tout droit dans `Declare His honour' (`Déclare son honneur') aux couleurs mystérieuses et qui devient une choeur entier. Les basses contraintes sont étrangement rares dans la musique religieuse (du moins en comparaison avec les Odes et ‘Welcome Songs’) mais le duo pour soprano et haute-contre ‘The Lord is great’ (‘Le Seigneur est grand’) en est un bel exemple, couronné par une autre ritournelle pour cordes à l'invention merveilleuse. La section centrale de l'hymne est le quatuor `O worship the Lord in the beauty of holiness' (‘Oh, adore le Seigneur dans la beauté de Sa sainteté’) qui est un des plus magiques morceaux de musique que Purcell ait jamais écrit. Après une écriture aussi admirable, l'antiphonie de basse solo avec le choeur et les cordes revient à ‘Tell it out among the heathen’ (‘Va le révéler aux païens’) et mène à la section finale des alléluias. De façon typique, Purcell traite ces alléluias avec douceur et l'hymne se termine sereinement. O sing unto the Lord ist ein relativ spätes Werk, das in der Gostling Handschrift als ‘geschrieben von Mr. Purcell im Jahre 1688’ vermerkt ist. Es zeigt Purcell unter besonders ausgeprägtem italienischem Einfluß, mit kraftvoller Antiphonie zwischen Gesangsstimmen und Instrumenten sowie zwischen einem führenden Baßsolisten und dem Chor. Es scheint sich dabei um ein Verse Anthem zu handeln, das für einen besonderen Anlaß komponiert wurde, als das große Streicherensemble zur Verfügung stand. Jedenfalls sind die Akkordblöcke, die das Werk einleiten, besonders geeignet für eine üppigere Orchesterformation. Vor dem imitativen Abschnitt, der bei den Anthems fast immer die zweite Hälfte der Sinfonia ausmacht, fügt Purcell hier unüblicherweise eine herrlich expressive Passage mit reichlich Chromatik und verminderten Akkorden ein (in diversen Manuskripten mit der Anweisung `schleppend' versehen). Obwohl die Kompositionsweise eindeutig festlich ist, macht sich dahinter jene Versonnenheit bemerkbar, die ein Merkmal so vieler Kompositionen von Purcell ist. Nach der Sinfonia der Streicher eröffnet ein Baßsolo feierlich das Geschehen, gefolgt von zwei klangvollen chorischen Allelujas, ehe wir in den Genuß des ersten von mehreren einfallsreichen Instrumentalritornellen kommen. Die vierstimmig dargebotene Strophe ‘Sing unto the Lord and praise his name’ geht direkt in das geheimnisvoll klingende ‘Declare his honour’ über, das zu einem vollständigen Refrain erblüht. Ostinatobäße sind (im Vergleich mit den Oden und Welcome Songs) in Purcells Kirchenmusik dünn gesät, doch das Duett ‘The Lord is great’ für Sopran und Tenor ist eine der zauberhaftesten Kompositionen, die er je geschrieben hat. Nach soviel musikalischer Ehrfurcht setzt bei ‘Tell it out among the heathen’ erneut das Wechselspiel zwischen Solobaß und Chor bzw. Streichern ein und mündet in einer abschließenden Alleluja-Passage. Typischerweise geht Purcell sanft um mit diesen Allelujas, und das Anthem klingt heiter friedlich aus. O sing unto the Lord a new song. Alleluia. Sing unto the Lord all the whole earth. Alleluia. Sing unto the Lord, and praise his name; be telling of his salvation from day to day. Declare his honour unto the heathen, and his wonders unto all people. Glory and worship are before him; power and honour are in his sanctuary. The Lord is great, and cannot worthily be praised; He is more to be feared than all gods. As for all the heathen, they are but idols; but it is the Lord that made the heavens. Tell it out among the heathen that the Lord is king, and that it is he who hath made the round world so sure that it cannot be moved, and how that he shall judge the people righteously. Alleluia. Amen.